This is not acceptable. 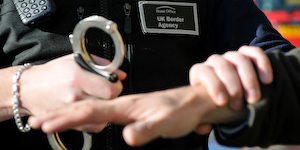 Border control does indeed entail arrests and enforcement and all that nasty stuff. Sometimes. But it is not and should not be the core business of the UK Border Agency. This kind of imagery is horrible, authoritarian, and dehumanising, and I’m appalled at the kind of mentality that it implies. It’s not the way that we should be presenting ourselves to visitors.